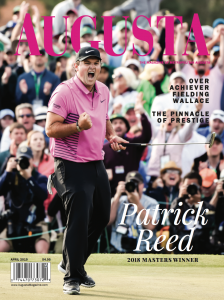 Twelve years ago, I was offered an exciting opportunity to lead Augusta Magazine. I accepted and moved fromThe Augusta Chronicle around the corner to the offices on 7th Street. I had always been a fan of the magazine, but I wasn’t sure of all the things I would need to learn to be successful. Fortunately, there were some very talented staff members already in place who willingly helped me understand the magazine business. I’ve always had an awesome team—many have gone on to other opportunities over the years—and I am thankful to each of them. The people listed on the masthead, including our freelance writers and photographers, are the team that bring you this quality publication each issue. In the meantime, I also had the opportunity to work more closely with so many of our advertising customers and ad agencies, getting to know them better. Because we are a local magazine, our customers are in the Augusta area and I can personally attest that we have a great number of outstanding businesses in our area, committed to the local community and to making their businesses prosper. Thank you to all of our customers for the investment you have made in the magazine and your continued confidence in us. During my time at the magazine we’ve grown, delivering a greater number of quality products to niche audiences. It’s been fun and rewarding to add two issues of Augusta Magazine, launch Augusta Family Magazine, skirt! magazine and Aiken Homes and Lifestyles Magazine for readers and advertisers, and to watch them grow in popularity. I’ve lived in Augusta and been with the company for almost 30 years, held a wide variety of positions including reporter, marketing director and display advertising manager. I married my husband in Augusta, we had a child, made lots of dear friends and created many memories, so this is a bittersweet departing. We will be moving the first of June to eastern North Carolina as I take the position of director of a United Methodist Camp and Retreat Center. The new publisher will be Ashlee Griggs Duren. She grew up in Augusta, graduated from the University of Georgia and has been with Morris Communications for more than 15 years. She is very excited about her new position and will add her own special touch to Augusta Magazine. I have loved being the publisher of Augusta Magazine and living in Augusta. It has been a wonderful place to call home, with great people, a charming ambience, a vital business community and an awesome quality of life. The summer heat and humidity? Maybe I won’t miss that too much. To all our readers and advertisers, my team and the company, I thank you for your support and wish you all the very best. This article appears in the May 2015 issue of Augusta Magazine.